MV George Robinson is a beautiful old steel-hulled vessel fitted out with Tasmanian timber and brass. Affectionately known as “The Red Boat”, it has been plying the Arthur River for 33 years. We depart daily at 10am from the Arthur River township, returning at 3pm. Passengers are able to move freely around the vessel, including the front and rear viewing decks which allow opportunities for stunning photographs. Having the helm located in the main passenger lounge invites free-flowing discussion with the Skipper and also promotes a relaxed and jovial atmosphere. Enjoy the serenity of the river and the unhurried pace of the MV George Robinson. 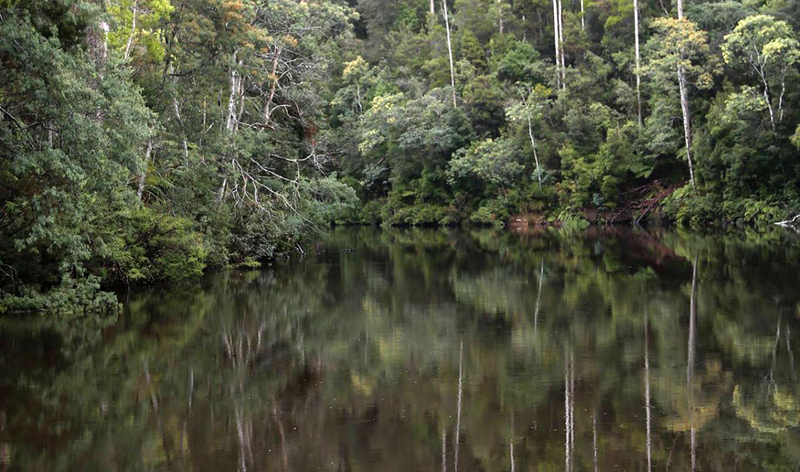 Be spellbound by the magical reflections of the lush vegetation in the tannin coloured river. Drink in the pristine densely forested river banks of myrtles, blackwoods, leatherwoods, sassafras, silver wattles and endangered Brooker’s gums. At Turk’s Landing, gaze up at the giant brown top stringybark (Tassie Oak) and marvel at the ancient giant tree ferns. We even cruise for 2 people. Children and guests with a disability are welcome. There are toilet facilities on board the vessel.